Ald. 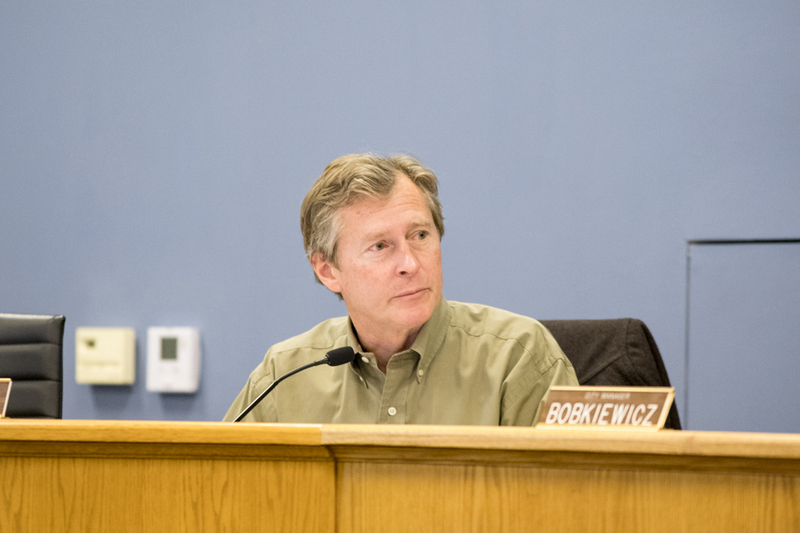 Donald Wilson (4th) listens at Monday’s City Council meeting. Wilson said he supported Albion Residential’s proposed development because it would increase the supply of rental units in Evanston. The approval of the newest 15-story addition to downtown Evanston was met with a chorus of boos and jeers from residents as a months-long debate over Albion Residential’s proposal reached its conclusion. Aldermen voted 5-4 to approve the Sherman Avenue apartment tower Monday at a City Council meeting, in a contentious decision that some say could set a new precedent for development in downtown Evanston. The decision marks a major defeat for community members who believe the project does not meet affordable housing needs and will increase gentrification. Alds. Judy Fiske (1st), Melissa Wynne (3rd), Eleanor Revelle (7th) and Cicely Fleming (9th) voted against the proposal. Jason Koehn (Kellogg ’03), president of Albion Residential, told The Daily the “hard work” for the group starts now, as it collaborates with the city to get the project off the ground. He said as the development moves forward, the group needs to listen to the “tons of people” in the community who care. The tower will house 273 residential units, 6,800 square feet of commercial space and 200 parking spots. It will be erected on the lot currently occupied by Tommy Nevin’s Pub and Prairie Moon restaurant. Following the approval of Albion’s proposal, Tommy Nevin’s Pub will close next week while Prairie Moon will be housed in the new development. Ald. Donald Wilson (4th) said building on what is “effectively an empty lot” will not force people to leave Evanston — a common critique of the project. The only way to stabilize housing prices, he said, is to increase supply of housing stock. Otherwise, Wilson said, prices will continue to rise. Still, dissenting aldermen voiced concerns about the proposed project. Fiske said the building is too large and “dense,” and that she thought the size of the site and proposal are incompatible. She said there is a problem with the way expectations for buildings are communicated to the community and developers. Clare Kelly, an Evanston resident who opposes the development, told The Daily she thought the aldermen’s decision sent a “clear message” that they had no concerns about gentrification in Evanston. She added that the approval of the project will set a low bar for other developments. Koehn said Albion hopes to break ground on the site in the first half of next year. Looking forward, he said the group is excited to build an apartment tower near public transportation in a “diverse” community.